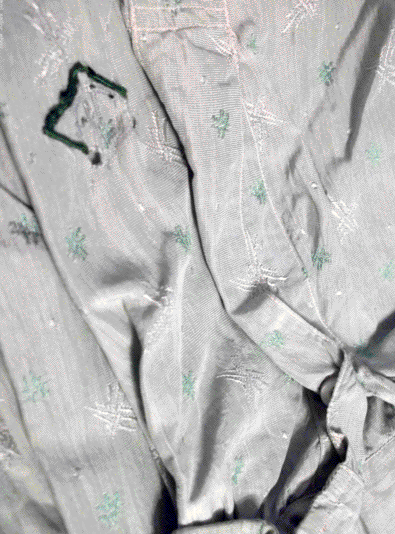 Dapper dresser Alphonse "Snorky" Capone's personally owned 1928 custom made silk shirt . It is in Al Capone's favored green color. The shirt order was taken by Mr. Peter M. Arl on April 17,1928. Mr. Arl worked in the shirt department at Marshall Field in Chicago. 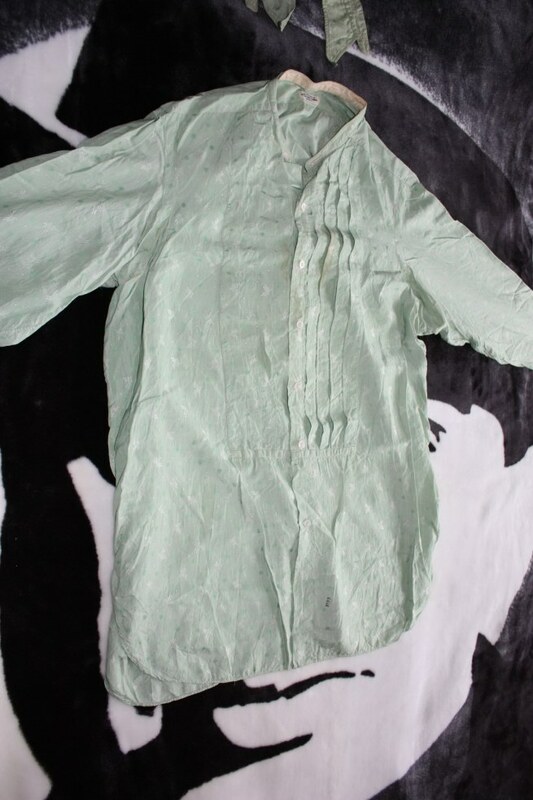 Al Capone's monogrammed light green pleated silk shirt with white and dark green pattern. Al Capone's favored color was green, everything from his suits, automobile, shirts, and even his bathroom tiles. I get many emails asking the question what ever happened to Al Capone's hundreds of shirts and suits he was reported owning during his lifetime as is stated in books and magazines on his life. 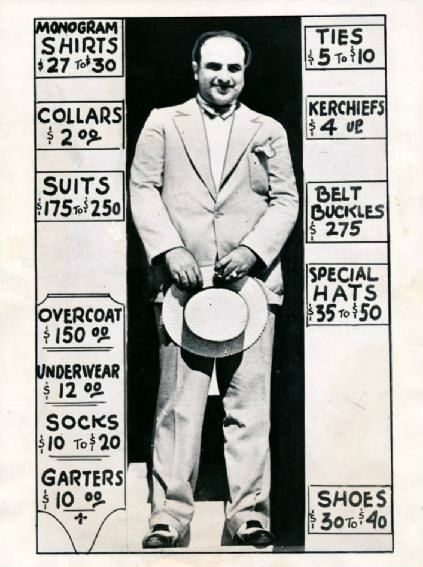 The Capone ownership to these many pieces of clothing were first divulged to the world during his 1931 income tax trial. What happened to them? Well, before and after Al passed away, his wife Mae gave many to family, friends and she even donated some to goodwill. 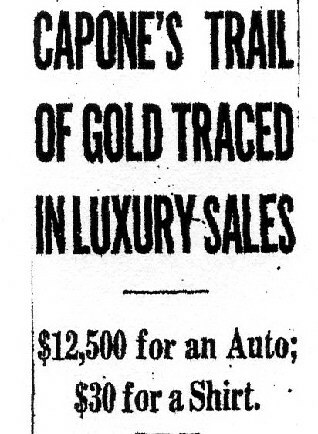 You have to remember that back at that time nobody was eager to own something that belonged to a criminal. 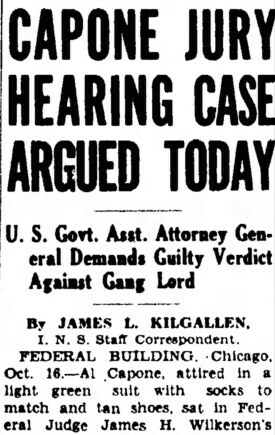 Capone was especially shunned and vilified by the common people after his trial. 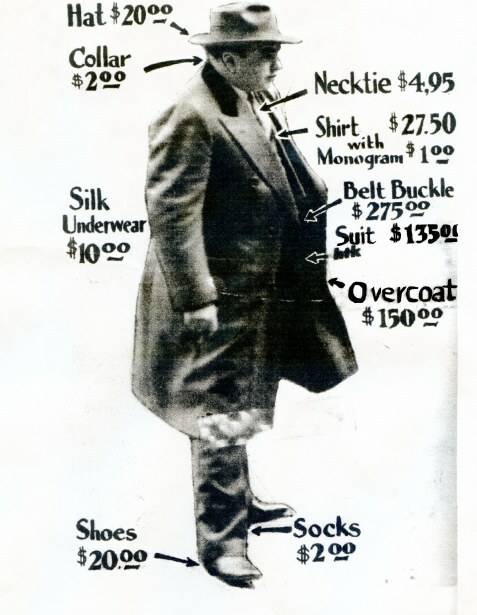 Today people would go to great lengths to own a piece of clothing from the granddaddy of all gangsters. 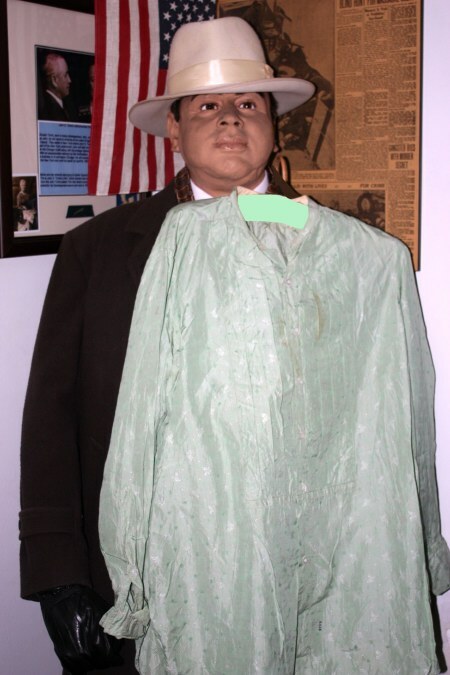 Here at myalcaponemuseum, I am proud to finally show all the interested history buffs one example of Al Capone's famous custom made shirts that has recently surfaced from a family member's possession and is now here in the collection. The items included ties, underwear, handkerchieves mostly all monogrammed with his famous AC initials on them. Al Capone's personally owned items were only monogrammed A.C. , not AL, not A, not C, or any other letters!! 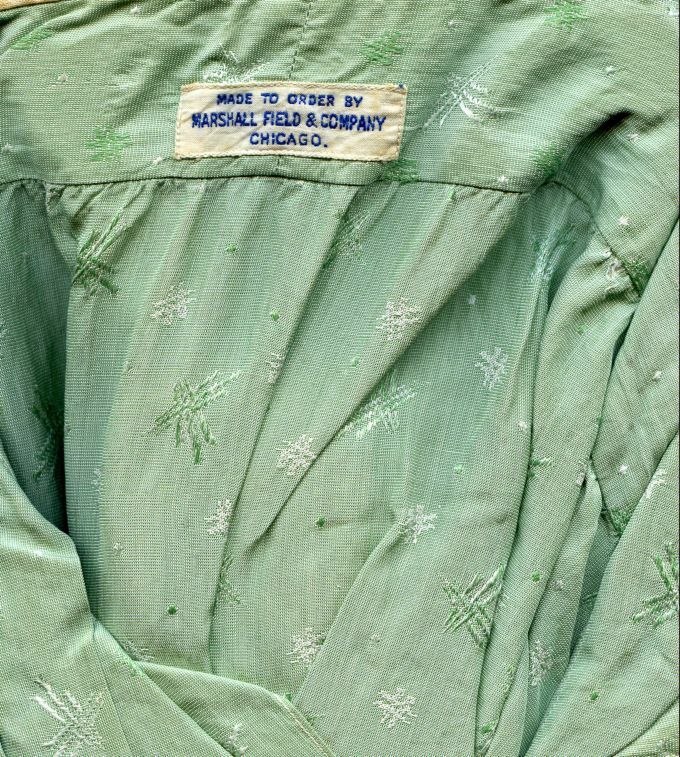 Al Capone's custom made silk shirt from Marshall Field Chicago. 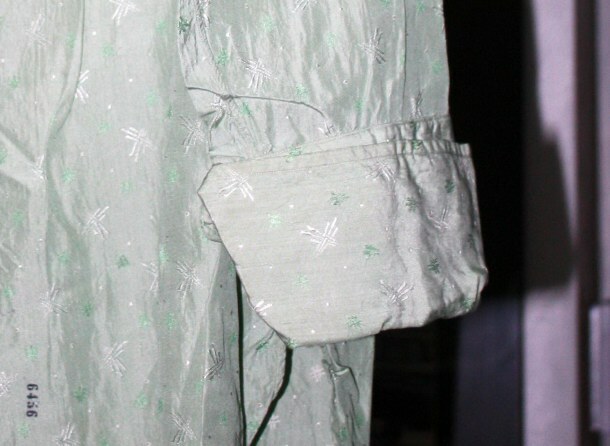 Close up of Capone's shirt with front pleated style. 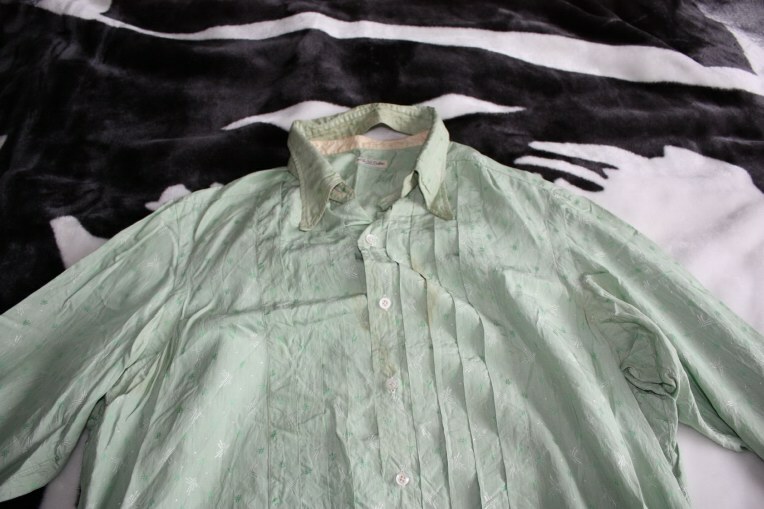 This shirt shows some stains on the front and on the collar. There are several tiny pin holes on back and collar which is not bad considering it's age of 90 plus years. 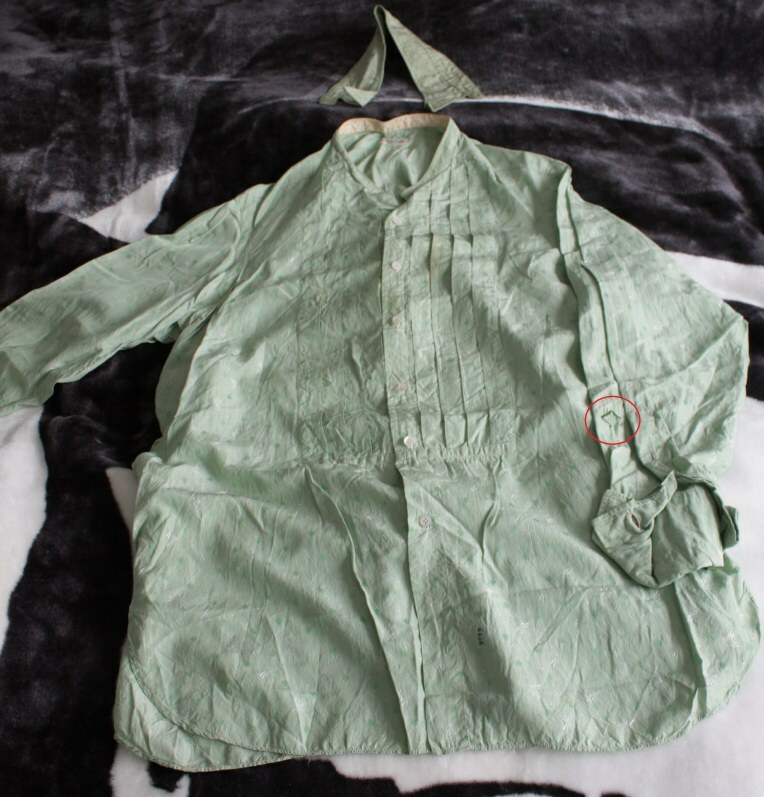 In the 1920's, this French fashion style shirt was referred to as a "pleated bosom" shirt with detached replaceable collar and french cuffs (sleeves longer than hands which were double folded). Today, a pleated shirt is generally white in color and is only used for formal attire (tuxedo) because it is frowned upon to use a pleated shirt with a regular suit. In the 1920's, pleated shirts were in different styles and colors and could be used with business suits matching the color of the shirt. It was not strictly used only for formal wear. French style double cuffs which needed cufflinks. Back of shirt with detachable collar. In the 1920's, a person would buy a shirt and multiple collars. The collars were the first to get grease and grime and were easily replaced. Newspaper diagrams showing the expenditures by Al Capone to look Snorky. 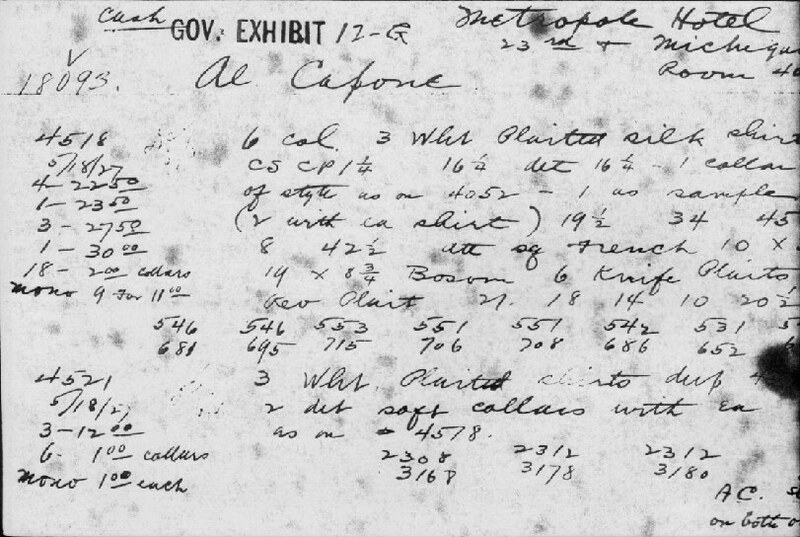 Click on link below to read the actual transcript from Al Capone's tax trial concerning his shirt purchases. Newspaper headlines for October 13th and 16th 1931. 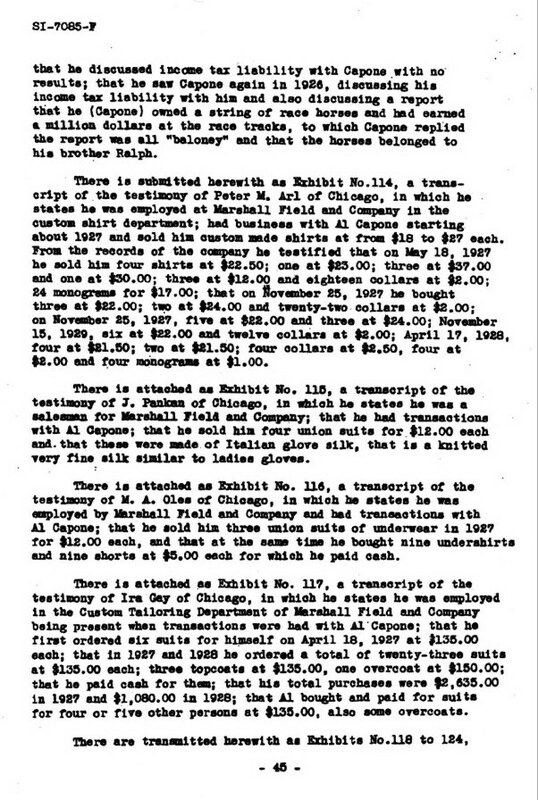 Number 9 on the list shows confirmed evidence for years 1927- 28 of Al's purchase of custom made shirts at Marshall Field through testimony of sales clerk.The other years are just stipulations. A December 21,1933, Treasury Dept. 's Internal Revenue Service transcript repeating the evidence that was showing Al Capone's expenditures during his 1931 tax trial. This page focused heavily on Al Capone's Marshall Field custom clothes dept. purchases. Besides buying shirts in person at Marshall Field, Al Capone even made the MF store tailors come to his headquarters when he was at the Metropole Hotel according to this Government trial exhibit. Note at left monograms 1.00 dollar each and at bottom right AC on both orders. 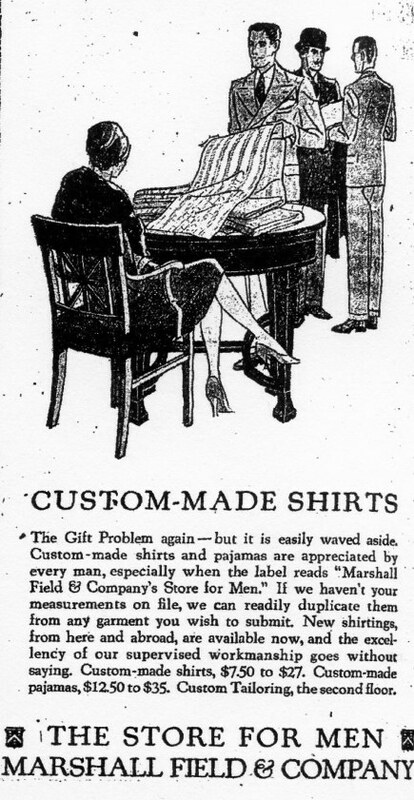 Marshall Field Chicago Custom clothing ad 1927. Capone went to the second floor for his custom shirts. Proudly trying out Al Capone's shirt. I dilligently measured it ( neck, shoulders, chest and waist) and I am pleased to report that it is 100% consistent with his measurements taken from court evidence. A 1921 article mentions a new style of French fashion that has arrived. The style matches up pretty much to Al Capone's shirt shown on this web page. Back then, having a subtle monogram on the left arm was the fashion. Some state it was a status symbol of business or success. Some state it was also to avoid any mix up when sending it out to be laundered. Today, monograms are mostly put on the front pocket or cuffs. Most custom shirt wearers today rather omit the monogram altogether stating that it looks snooty or snobbish. Top: On left sleeve (forearm) you can see a small subtle diamond shaped AC monogram that I have circled in red. 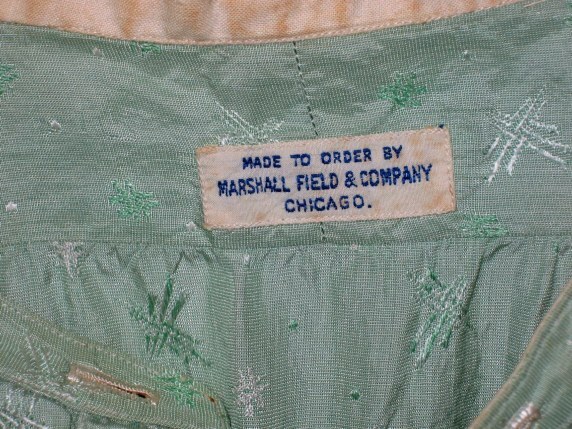 Bottom: October 12,1931, testimony from Marshall Field's Custom shirt dept. employee Peter M. Arl. 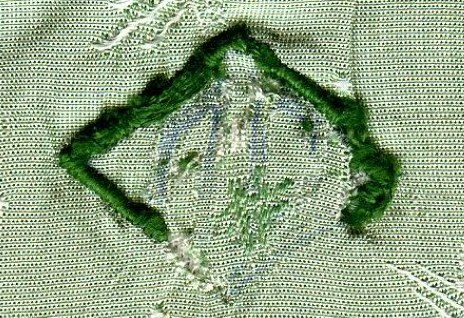 Left arm sleeve of shirt (Forearm) has a small AC monogram in lavendar. This was the lettering template for the green silk threads applied. 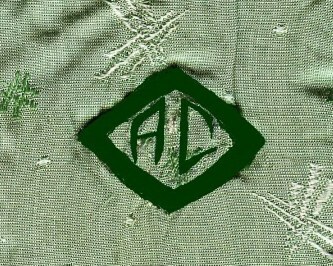 Close up of AC monogram amplified using Epson scanner. 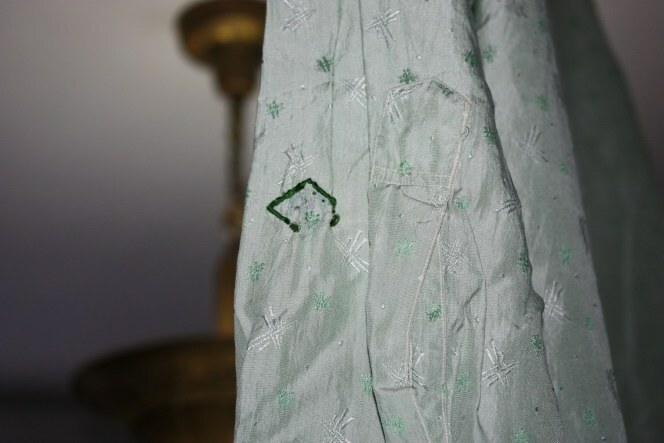 Though the AC is still visible, some clothes moths had attacked the green threads of the monogram when it was stored in the O'Donnell family attic for years. This is what the momogram might have looked at without moth damage. Made to order by Marshall Field Chicago. Yep! That's Al Capone sweat on that collar! Close up of stain on front top of the shirt. Drool, soup or sauce? Close up of inside tag and shirt pattern using Epson scanner. Detachable collar. There were three slots on collar that attached to shirt. Fourth slot was for wearer to button up shirt (white button that is sewn on collar). The two loops at both ends of the collar were for the necktie to go through. 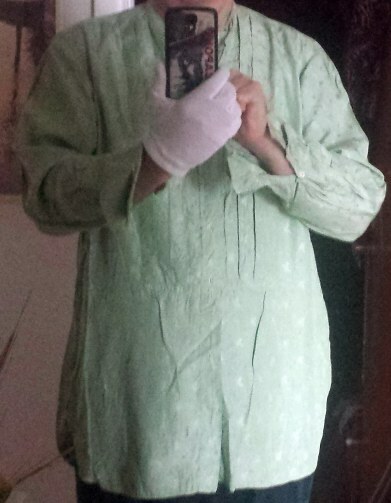 This also reinforced the collar's attachment to the shirt. Ralph Capone Sr. owned shirt studs. These would go in the shirt in order to attach the shirt collar to the shirt body. 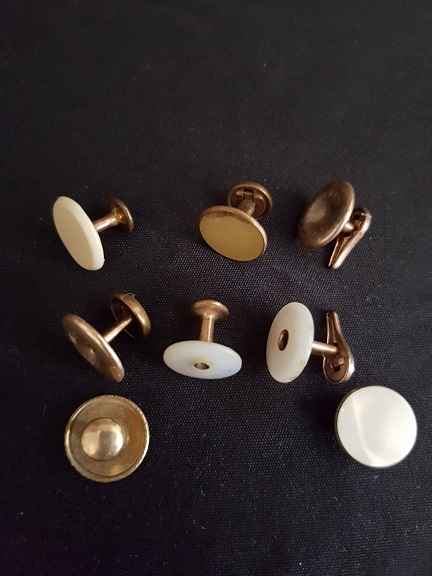 These shirt studs came from Ralph Capone's Estate. 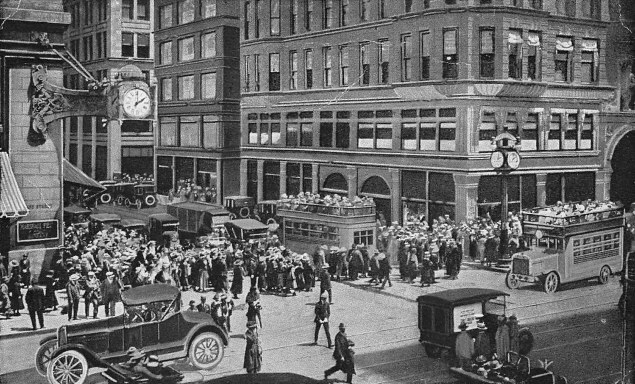 Marshall Field (Left with clock on side of building) at Washington and State streets circa 1928. This was one of Al Capone's favored clothing stores. It is now under the banner of Macy's. Custom made shirts from different rolls of fabric could be had on the second floor of Marshall field. Matching numbered shirt and collar. I.D. 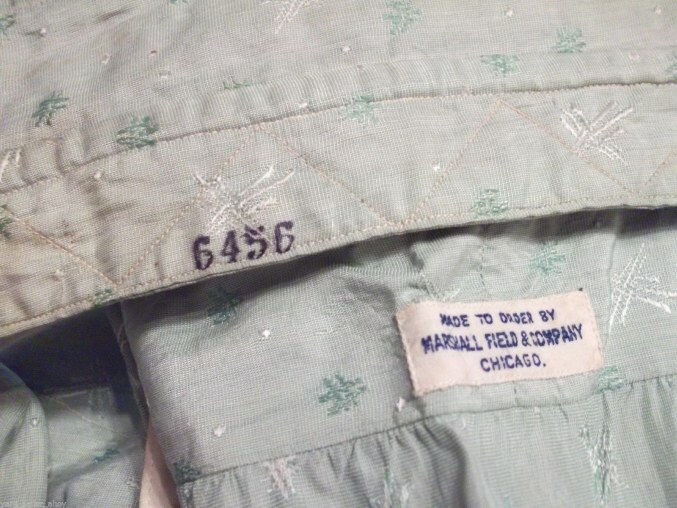 Order number and Marshall Field tag (collar area). 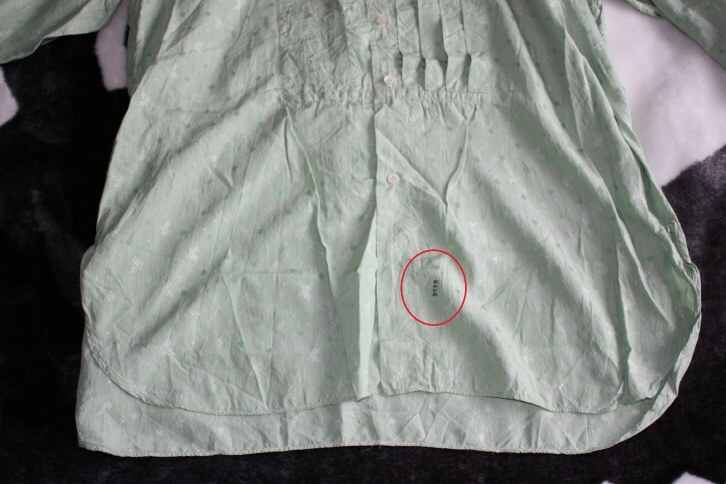 6456 was also stamped on the bottom of shirt. This part tucks into the pants. 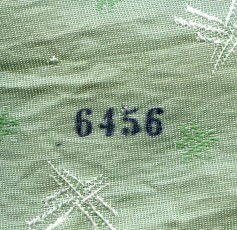 Seeing as Capone ordered dozens of shirts and collars of the same colored hues at a time, this specific order number stamp was used to make sure that the correct collar was put onto the right corresponding shirt. 6456 stamp on the collar. 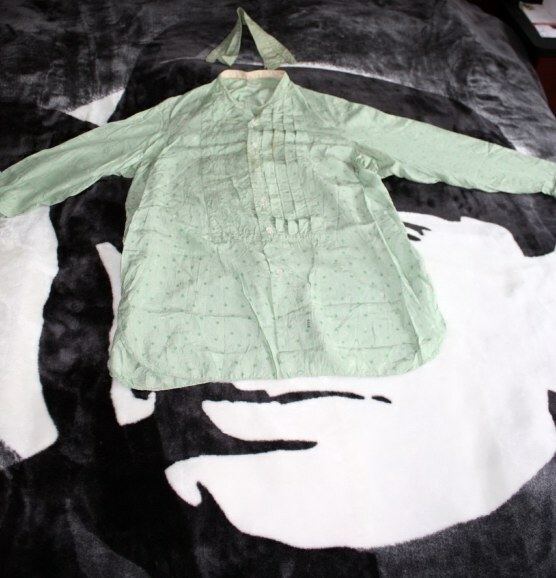 The shirt comes from a man who was related and who met Al Capone through his family connection with Mae Coughlin Capone's sister Agnes Coughlin Clark. 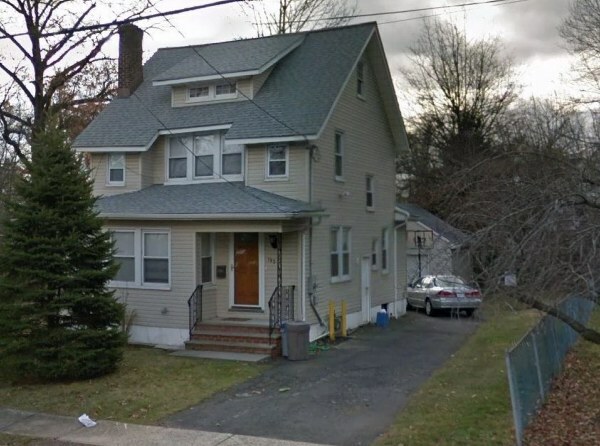 In 1930, Agnes and her husband Cornelius "Neil" Clark settled at 135 Bush Avenue in Mountainside, Union County, New Jersey where her husband worked a steam shovel operator. The Al Capone shirt came from Maurice Crowley O'Donnell. 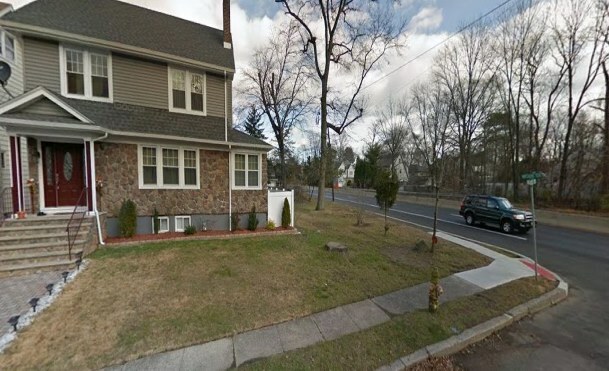 In late 1920, early 1930, his family lived on Mountain Avenue also in Mountainside, Union County, New Jersey. They lived about 2.5 miles apart from the Clarks. Maurice was an apprentice carpenter/painter, the son of an Irish road grading laborer named James Joseph O'Donnell. James Joseph O'Donnell's sister Catherine was married to Louis Clark and they had a son named Cornelius Clark. 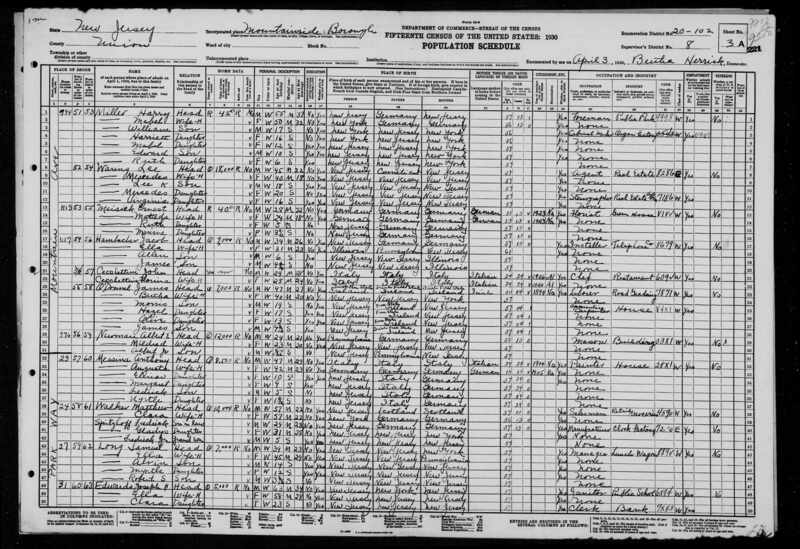 Cornelius Clark and Maurice O'Donnell were cousins. 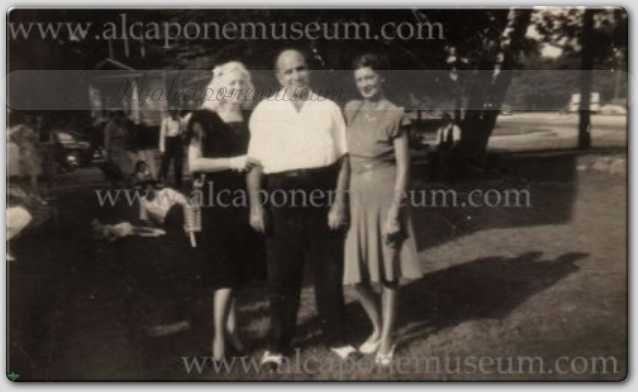 Cornelius Clark married Agnes Coughlin who was Mae (Coughlin) Capone's sister. Most all of the O'Donnell and Clark men made their living in the construction trade. Funny enough, Cornelius' brother Louis married Agnes' sister Muriel making it two brothers marrying two sisters. 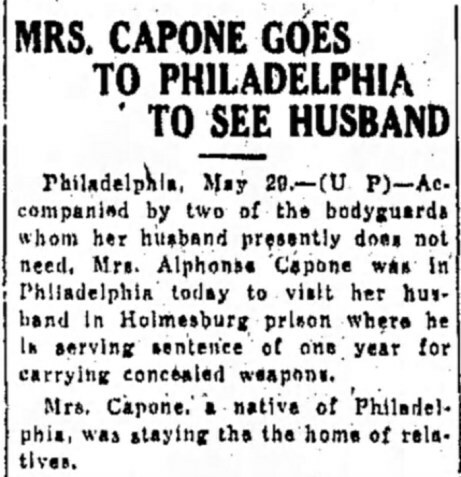 Agnes' and Muriel's sister Mary (Mae) Coughlin married none other than Alphonse Capone. Mae had stayed at her sister's house during the time Al was incarcerated in Philadelphia from May 1929 to March 1930. Mountainside was about 100 miles from both Holmesburg Prison and Eastern State Penitentiary. 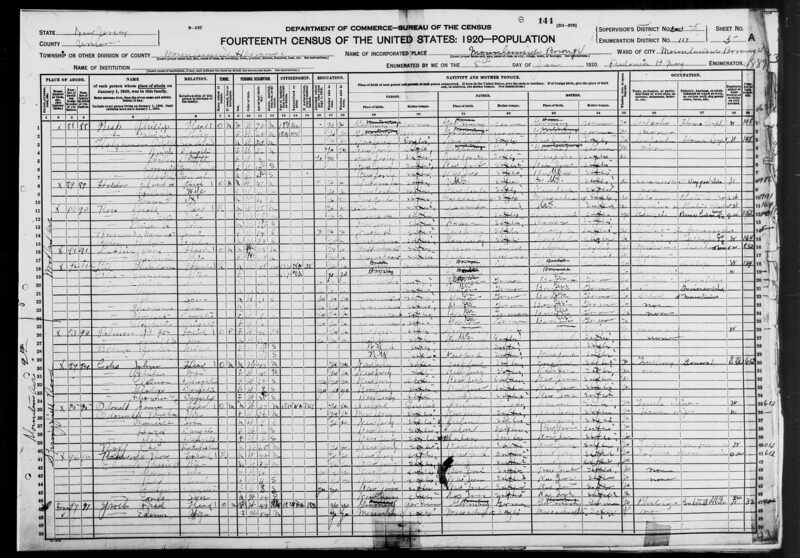 I mention both because Al is transferred from Holmesburg to Eastern State in August of 1929 due to overcrowding. 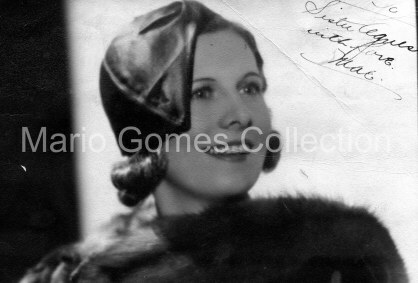 Studio photo signed by Mae Capone for her sister Agnes Clark. She wrote "To Sister Agnes with love Mae." The Coughlin sisters were real close. Mae staying with relatives which was her sister Agnes who at the time lived in Mountainside, New Jersey. Al is later transferred in August 1929 to Eastern State Penitentiary. The travel distance and time remain about the same for Mae to visit Al from her sister's home in Mountainside, N.J.
(The Courier Express May 30,1929). Maurice Crowley O'Donnell got to see Mae, Sonny and Al whenever they went over to visit Mae's sister Agnes Clark in Mountainside and later in Scotch Plains. This may have been as early as 1929, when Al stopped by in Atlantic City for the gang conference. The sisters along with their other sibling Muriel were known as the three dollies. Al took a liking to Maurice, who he would call Morris instead of the french pronounced (More eeze). One sport Al like to partake in when visiting Mountainside was target shooting. Maurice would line up coke bottles on a fence for target practice. When setting up the bottles Maurice turned around and jokingly asked Capone with a bit of truth "You wouldn't shoot me would you Al?" Al laughed exclaiming "Naw! I like you kid." From then on there were many encounters for Maurice and his family with the Clarks and the Capones. 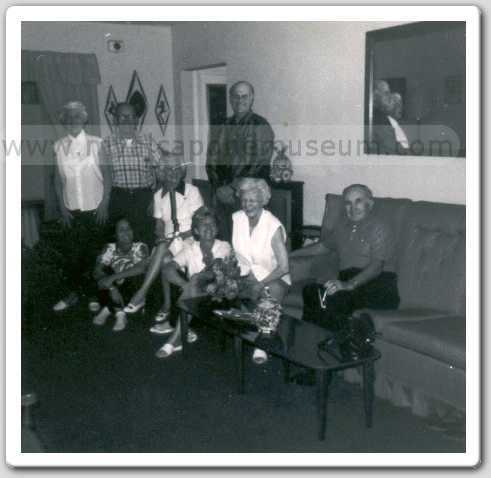 Maurice, along with his wife, kids and father (James O'Donnell) would drive to 93 Palm Island Miami Beach to visit Mae and Sonny while Al was in prison. By 1938, the Clarks had moved to Scotch Plains, New Jersey and Maurice O'Donnell had moved out of his father's house to live with his family in Plainfield, New Jersey. They always stayed not too far form each other, whether it was from Westfield, Mountainside, Plainfield or Scotch Plains, Maurice still lived still only 2.8 miles away from the Clarks and still visited each other occaisionally sometimes even meeting up in Miami. On March 19,1940, Al , Mae and family had left Baltimore after having given up on Al's inpatient paresis treatments. They stopped by in Jersey to see Agnes and friends before making the long trip back to Miami Beach. Excerpts from Maurice C. O'Donnell's personal agenda written on January 29,1978. 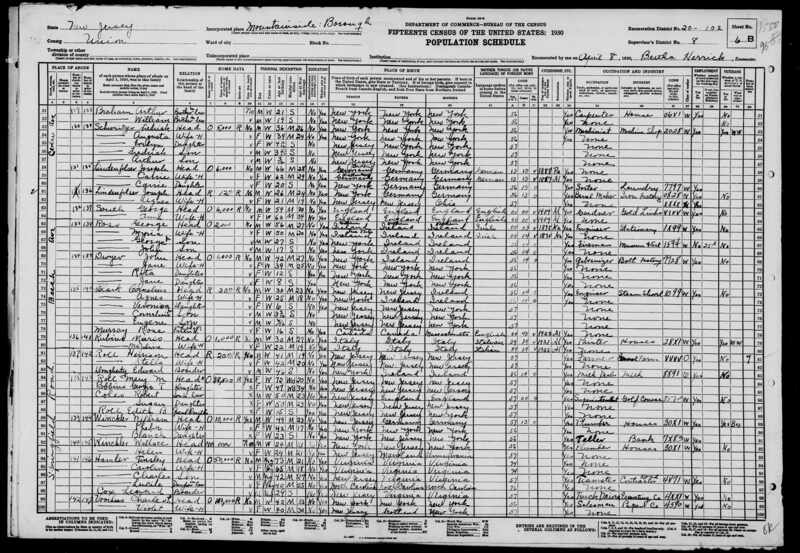 In January 1939, Maurice O'Donnell, his wife Florence, daughters Gladys and Barbara along with his parents James and Bertha made the trip to 93 Palm Island to see Mae and Sonny. Al at this time was still not home. Top entry shows an interesting nickname Al had as a kid in Brooklyn. His runny nose dripped onto his lips and the other boys would call him "Spaghetti" because of it. Mae Capone, Al and Muriel Clark (Mae's sister) in Scotch Plains, New Jersey, for Agnes Clark's (Mae's sister) daughter's wedding on June 16, 1945. In this photo, they are standing in front of 195 Watchung Terrace facing the Clark's home (192 Watchung Terrace). 195 Watchung Terrace. This is what the area in the 1945 photo looks like today. In both photos, you can see Route 22 to the right. 192 Watchung Terrace. Agnes Clark's (Mae's sister) house. They had moved here from 223 Park Avenue in Plainfield which was an 11 minute drive to their new dwelling. Maurice O'Donnell's home was about a 7 minute drive. In the 1945 wedding photo above, Mae, Al and Muriel are facing toward this house when the photo was snapped. Maurice O'Donnell would get to see Al a couple of times before Al's death in January of 1947. Notably when Al stopped by in 1940, but also to attend a Clark family wedding. Agnes and Cornelius' daughter Veronica was getting married June 16,1945. Al was having good days and bad days. At the wedding he was cheery, but had to be lead to whatever situation was presented to him. Everybody, including the surrounding neighbours on Watchung Terrace were in awe of seeing the close guarded Al Capone walking around in their neighbourhood. 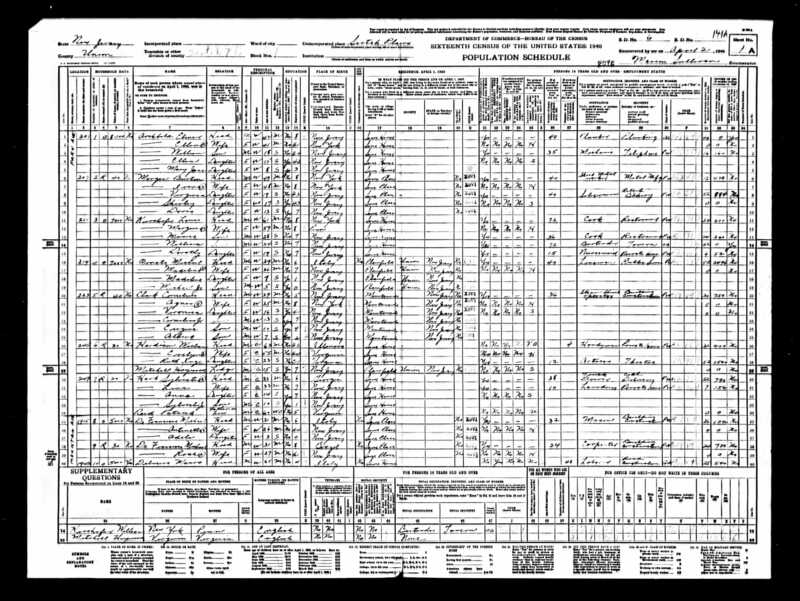 Click on various links to documents below in which verifies Clark / O'Donnell family connections and 1940 Census for story that corresponds to Maurice O'Donnell, his wife Florence, daughters, Gladys and Barbara in 1978 diary entry. The Clarks /Coughlins in 1970. Sitting left is Dottie (Sonny's second wife). next to her is; Mae Capone, Veronica (Vera), Muriel and Louis Clark. 1947 Miami Dade Directory showing that Maurice O'Donnell's cousin Louis Clark and Muriel (Mae's sister) temporarily moved in with Mae Capone at 93 Palm Avenue, Palm Island, Miami Beach, Florida. Louis Clark (Maurice C. O'Donnell's cousin) and his wife Muriel Clark (Mae's and Agnes' sister) made the transition from Chicago to live in Florida and stayed with Mae for moral support before and after Al's death (1946 to 1947). They later moved to Hollywood, Florida where Louis Clark found a job as a city maintenance man for the water dept. After Al's death, in-law Maurice O'Donnell continued to visit Mae and Sonny at 93 Palm Island. 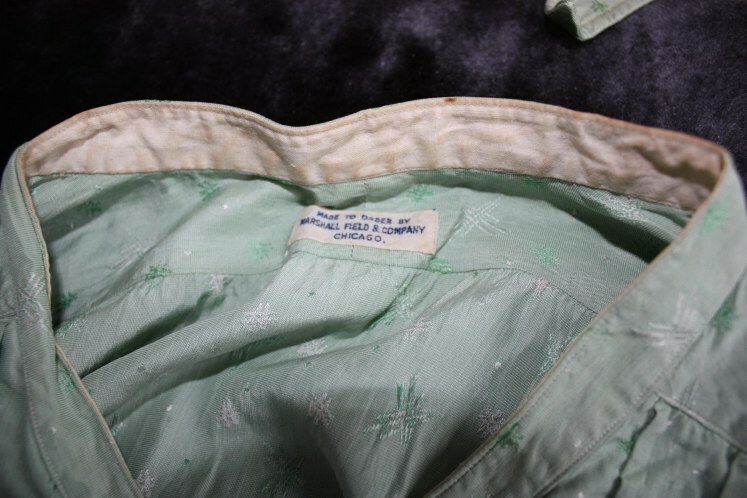 One day, when on one of these visits, Mae gave Maurice O'Donnell one of Al's favorite monogrammed shirts that were custom made at Marshall Field in Chicago. 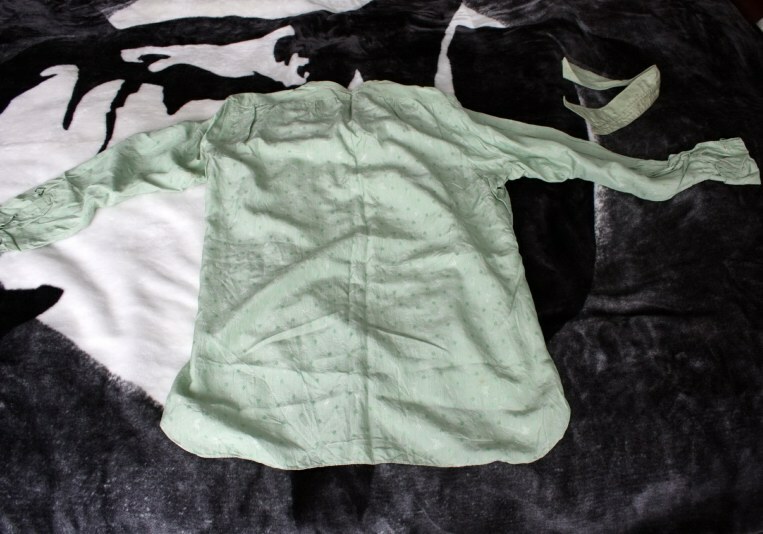 The circa 1928-29 silk shirt was in Al's favored light green color with dark green AC initials above the left sleeve. These colors were also his favored choice for the bathroom tiles at the Lexington and in his personal hanging bathrooms at 93 Palm Island residence. Maurice hung on to this family keepsake for many, many years and in 1978 decided to place an entry about it his personal agenda booklet. 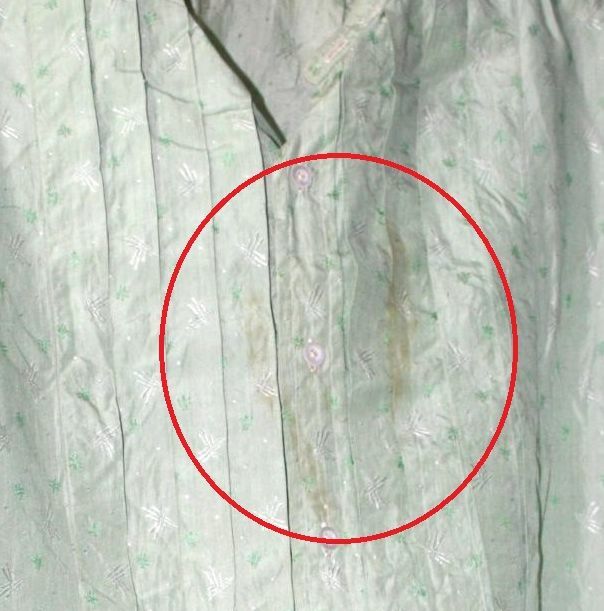 After Maurice C. O'Donnell and his wife Florence passed away, the Al Capone shirt was found in the attic of their home by their daughter Maureen. Maurice O'Donnell headstone in New jersey. (Photo courtesy of Melinda Pennington). Here is an interesting link to a 1920's written memoir done by Harriet Wentlandt Carmichael, a school teacher that did a walking tour of Mountainside. In it she notes the homes of Clarks, O'Donnells, Herricks and the Capone connection. 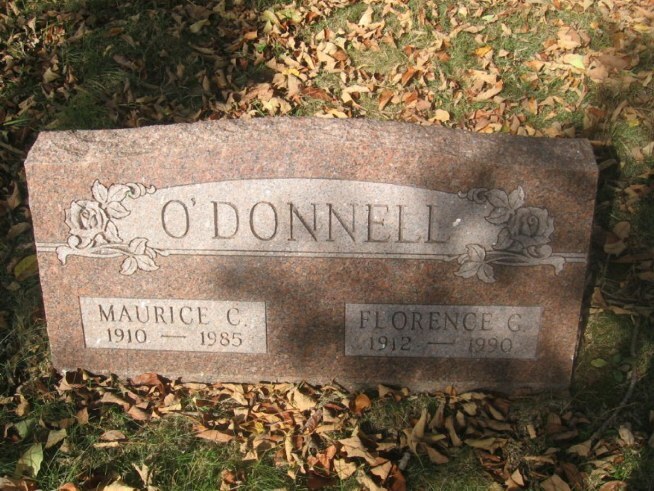 This web page is dedicated to the memory of Maurice and Florence O'Donnell. Special thank-you to Maurice O'Donnell's daughter Maureen Power, and also to Mae's relative, my dear friend Marianne, who confirmed the story for me. 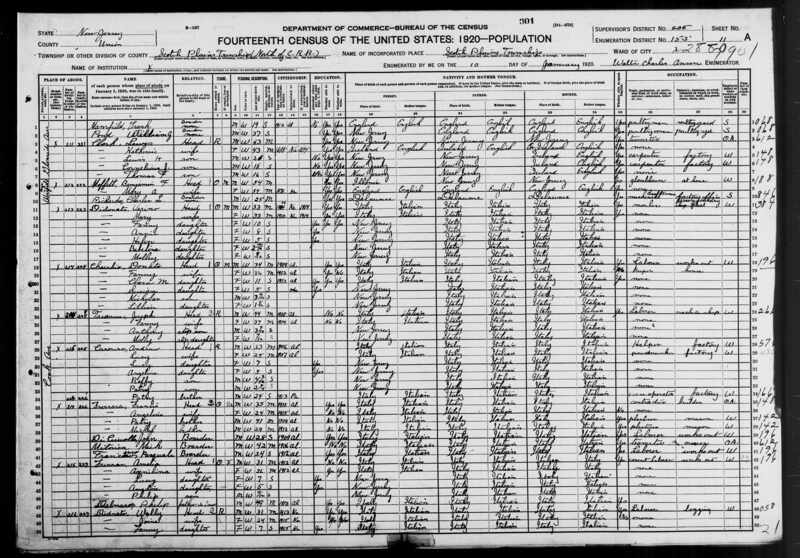 Without her lead and info on her great grandmother Katherine O'Donnell, I couldn't have connected all the dots. Extra Special thank-you to Rebecca Coviello for making all this happen and for keeping history alive!